Powered by a 750W direct drive motor, you can now chop, puree, slice and grate your food effortlessly. A must-have appliance for every kitchen, the Russell Hobbs 750W Food Processor makes cooking simple. Allowing you to slice, chop, shred and mix in just seconds, this food processor features a wide feeding chute and a safety interlock system. It’s direct drive motor features no gears or belts, allowing the motor to directly connect to the unit. This gives the food processor more power while using less! Used it straight away. Great kitchen appliance and price perfect. 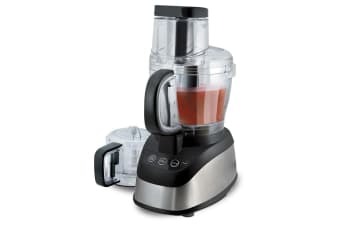 I'm happy and satisfied with the product "Russel Hobbs 750W Food Processor (RHFP750) purchased recently, I love it. This replaced a 15 yr old processor, and I'm loving this one.